Tahan won the die roll and chose to go second. Nadas started off the Duel by discarding Thunder Dragon from his hand to get 2 more copies from his Deck. He then Normal Summoned Batteryman Solar and tried to use its effect to send a card from his Deck to the Graveyard, but lost out to Ash Blossom & Joyous Spring. Next, he activated Allure of Darkness to draw 2 cards and banish Thunder Dragondark from his hand. He used Dragondark’s effect to add Thunder Dragon Fusion from his Deck to his hand. He Set a card face-down and then activated the effect of Danger! Nessie! in his hand. He randomly discarded a Batteryman Solar, then Special Summoned Nessie and drew a card. He used the effect of Nessie in his hand once again, and this time randomly discarded a Thunder Dragon. He Special Summoned another Nessie and then drew another card. He activated the effect of Danger!? Jackalope? next, and discarded White Dragon Wyverburster at random. He Special Summoned Jackalope and drew a card. He flipped his face-down Thunder Dragon Fusion next, and sent 2 Thunder Dragons and a Thunder Dragondark back to his Deck to Special Summon Thunder Dragon Titan. He used Solar’s effect to Special Summon a Batteryman Token to his field. He discarded a Thunder Dragon to get 2 more copies from his Deck and then used a Token, Nessie, Titan, and Jackalope to Link Summon Saryuja Skull Dread. He used its effect to draw 4 cards and send 3 cards from his hand to the bottom of his Deck. He activated Saryuja’s effect to Special Summon Thunder Dragonroar from his hand and then Tributed it to Special Summon Thunder Dragon Colossus from his Extra Deck. He Special Summoned Thunder Dragonmatrix from his Deck with the effect of Thunder Dragonroar and then banished 3 DARK monsters from his Graveyard to Special Summon Chaos Dragon Levianeer. He shuffled Evenly Matched from Tahan’s hand back into his Deck! Next, Nadas sent Nessie, Levianeer, and Colossus to the Graveyard to Link Summon Curious, the Lightsworn Dominion. He used its effect to send Eradicator Epidemic Virus from his Deck to his Graveyard and used Curious’s effect to send 3 cards from the top of his Deck to his Graveyard. He sent Solar and Curious to the Graveyard to Link Summon Knightmare Gryphon next and discarded Thunder Dragon to activate its effect. He Set Eradicator from his Graveyard, drew a card, and then Tributed a Dragonmatrix to Special Summon Colossus from his Extra Deck. He added another Dragonmatrix to his hand and then discarded Thunder Dragonhawk from his hand to Special Summon Thunder Dragonroar. He Tributed it to Special Summon another Thunder Dragon Colossus and then ended his turn. 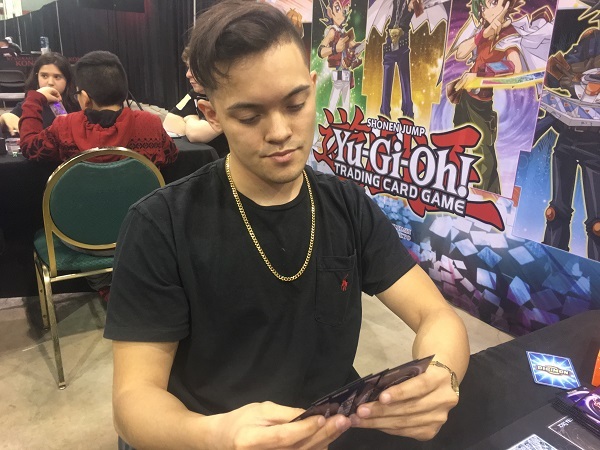 Tahan drew a card and then had Sky Striker Mobilize – Engage!, Pot of Desires, A-Assault Core, and B-Buster Drake in his hand. Nadas flipped Eradicator Epidemic Virus, Tributing a Colossus and declaring Spells. Rather than reveal his hand, Tahan conceded. 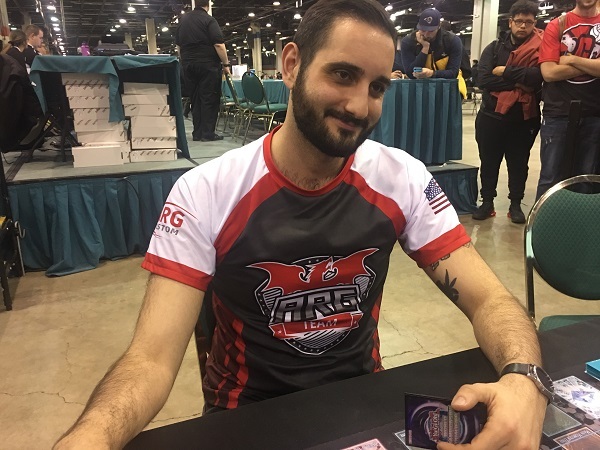 After a lucky hit with Chaos Dragon Levianeer, Denis Nadas takes a quick win in Duel 1! Tahan chose to go second once again. Nadas started off Duel 2 by revealing Danger! Nessie! from his hand to activate its effect. He discarded the Nessie at random and added a Jackalope to his hand. When he did, Tahan sent Droll & Lock Bird from his hand to his Graveyard to activate its effect. Nadas used the effect of another Nessie, but when it was randomly discarded, he got nothing in return! He used the effect of a Jackalope next, and he randomly discarded a Dragondark from his hand. He Special Summoned the Jackalope, but couldn’t draw a card due to the effect of Droll & Lock Bird. He Summoned Phantom Skyblaster next and tried to use its effect; but Tahan activated Infinite Impermanence from his hand to negate it. Nadas discarded Dragonroar from his hand to add Dragondark to his hand and passed. Tahan drew a card and then had B-Buster Drake, Sky Striker Mecha – Widow Anchor, A-Assault Core, and Droll & Lock Bird in his hand. He Summoned B-Buster Drake and attacked Phantom Skyblaster to destroy it. He sent B-Buster Drake to the Graveyard to Link Summon Clara & Rushka, the Ventriloduo in Main Phase 2 and used B-Buster Drake’s effect to add C-Crush Wyvern to his hand. He Set Widow Anchor and passed. In his End Phase, Nadas discarded a Dragondark to add another copy from his Deck to his hand. Nadas drew another Phantom Skyblaster and Summoned it! He activated its effect, but it was negated by Tahan’s Widow Anchor. Nadas attacked Clara & Rushka with his Skyblaster to destroy it and passed. Tahan drew Ash Blossom & Joyous Spring and then Summoned C-Crush Wyvern. He attacked Phantom Skyblaster to destroy it. Nadas drew Allure of Darkness and activated it, but Tahan Chained Ash Blossom & Joyous Spring to negate it. Tahan drew Union Hangar! He activated it and added C-Crush Wyvern to his hand and then Summoned it. He used Hangar to equip it with B-Buster Drake from his Deck. He sent his 2 monsters to the Graveyard to Link Summon Reprodocus and then activated the effects of the 2 copies of C-Crush Wyvern and the B-Buster Drake sent to his Graveyard. He Special Summoned A-Assault Core from his hand, added a copy of A-Assault Core from his Deck to his hand, and then Special Summoned the copy of A-Assault Core he had just added to his hand. He sent all of his monsters to the Graveyard to Link Summon Borrelsword Dragon next, and then banished 2 full sets of ABC monsters from his Graveyard to Special Summon 2 copies of ABC-Dragon Buster linked to Borrelsword Dragon! Nadas conceded, destined to be defeated on that very turn! A weak opening for Denis Nadas allows Calvin Tahan to recover from an equally weak start and win the second Duel! Nadas chose to have Tahan go first in Duel 3. Tahan opened up with A-Assault Core, Pot of Desires, C-Crush Wyvern, Terraforming, and Sky Striker Mecha – Widow Anchor. He activated Terraforming to add Union Hangar from his Deck to his hand and then activated it to add B-Buster Drake from his Deck to his hand. 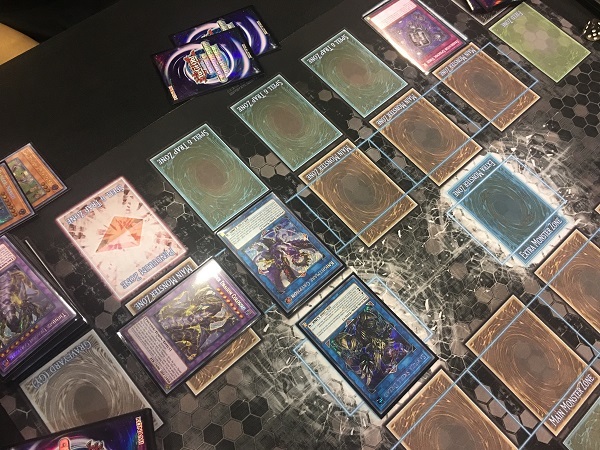 He activated Pot of Desires next, and banished the top 10 cards of his Deck face-down to draw Sky Striker Mecha – Hornet Drones and another Union Hangar from his Deck. He activated Hornet drones to Special Summon a Sky Striker Ace Token and then used it to Link Summon Sky Striker Ace – Kagari. He used Kagari’s effect to return Hornet Drones to his hand and then Normal Summoned B-Buster Drake. He used Union Hangar’s effect to equip it with C-Crush Wyvern from his Deck and then sent his 2 monsters to the Graveyard to Link Summon Reprodocus. He used the effects of C-Crush Wyvern and B-Buster Drake to add A-Assault Core from his Deck to his hand and then Special Summon C-Crush Wyvern from his hand behind Reprodocus. He used Reprodocus’s effect to make C-Crush Wyvern a Dinosaur and then Link Summoned Summon Sorceress. He used C-Crush Wyvern’s effect to Special Summon A-Assault Core from his hand linked to Summon Sorceress, and then used his Sorceress’s effect to Special Summon another A-Assault Core from his Deck. He banished an A-Assault Core from his field along with a B-Buster Drake and a C-Crush Wyvern from his Graveyard to Special Summon ABC-Dragon Buster and then used the effect of his on-field A-Assault Core to equip it to his Buster Dragon. He Set Union Hangar from his hand next, and then Set a card to his back row. Nadas revealed Tsuchinoko from his hand to activate its effect and then randomly discarded Nessie. He Special Summoned Tsuchinoko, drew a card, and then added a Tsuchinoko from his Deck to his hand with Nessie’s effect. He banished Nessie from his Graveyard to Special Summon Wyverburster next, and then Normal Summoned Phantom Skyblaster! He activated its effect to try to Special Summon Skyblaster Tokens to the field, and Tahan Chained his ABC-Dragon Buster’s effect as Chain Link 2 by discarding A-Assault Core from his hand. Then, he Chained his ABC-Dragon Buster’s other effect to Tribute it and try to return A-Assault Core, B-Buster Drake, and C-Crush Wyvern to his field. Next, with no monsters left in his Main Monster Zone, he Chained Sky Striker Mecha – Widow Anchor to negate Phantom Skyblaster’s effect and take control of it. After gaining control of it, A-Assault Core, B-Buster Drake, and C-Crush Wyvern were Special Summoned to his field. He used A-Assault Core’s effect to return the A-Assault Core that he discarded to his hand. Nadas activated the effect of the Jackalope in his hand next, and randomly discarded a Phantom Skyblaster. He Special Summoned Jackalope and drew a card, and then discarded Thunder Dragon from his hand to get 2 more copies of Thunder Dragon from his Deck. He discarded Dragonhawk to Special Summon a Thunder Dragon from his Graveyard and then activated the effect of Tsuchinoko in his hand. He randomly discarded the Tsuchinoko and Special Summoned it to the field. He combined Tsuchinoko and Jackalope to Link Summon Reprodocus, used its effect, and then Link Summoned Summon Sorceress linked to Thunder Dragon. He used its effect to Special Summon Dragonroar, then Tributed it to Special Summon a Colossus from his Extra Deck. He used Dragonroar’s effect to Special Summon Dragondark from his Deck and then Tributed Dragondark to Special Summon another Colossus. He used Dragondark’s effect to add Thunder Dragon Fusion from his Deck to his hand and then sent 2 monsters to the Graveyard to Link Summon Knightmare Phoenix co-linked with Tahan’s Sorceress. He discarded Thunder Dragon to destroy Tahan’s face-down Union Hangar and draw a card with his Phoenix’s effect, and then activated Thunder Dragon Fusion. He returned a Colossus and 2 Thunder Dragons to his Deck to Fusion Summon Thunder Dragon Titan and then discarded Thunder Dragon to use its effect. He Chained Titan’s effect to destroy A-Assault Core, and Tahan used A-Assault Core’s effect. Next, Nadas activated the effect of another Thunder Dragon in his hand and Chained Titan’s effect to destroy B-Buster Drake. Thunder Dragon Colossus attacked C-Crush Wyvern, and Tahan used its effect to Special Summon A-Assault Core from his hand. Knightmare Phoenix attacked and destroyed it, and Tahan returned an A-Assault Core to his hand with its effect. Titan attacked and destroyed Summon Sorceress next. In Main Phase 2, he activated the effect of the Nessie in his hand. He randomly discarded a Thunder Dragon and then Special Summoned Nessie to the field and drew a card. He ended his turn and regained control of Phantom Skyblaster. Tahan drew Droll & Lock Bird and then activated Hornet Drones. He Special Summoned a Sky Striker Ace Token to the field and then used it as a Link Material to Summon Sky Striker Ace – Kagari. He used Kagari’s effect to return Widow Anchor from his Graveyard to his hand and then Normal Summoned C-Crush Wyvern. He sent Kagari and C-Crush Wyvern to his Graveyard to Link Summon Knightmare Cerberus and then used the effects of Cerberus and C-Crush Wyvern. He discarded Droll & Lock Bird to target Nessie with Cerberus’s effect. He Special Summoned A-Assault Core from his hand and then destroyed Nessie and drew PSY-Framegear Gamma with Cerberus’s effect. He sent Cerberus and A-Assault Core to the Graveyard to Link Summon Knightmare Unicorn next, and activated its effect by discarding Gamma. He returned Titan to the Extra Deck and returned A-Assault Core from his Graveyard to his hand. Next, he banished A-Assault Core, B-Buster Drake, and C-Crush Wyvern from his Graveyard to Special Summon ABC-Dragon Buster and attacked Knightmare Phoenix with Unicorn to destroy it. ABC-Dragon Buster attacked and destroyed Phantom Skyblaster next. Tahan Set Widow Anchor and then passed his turn. Nadas banished Thunder Dragon Fusion from his Graveyard to add Denko Sekka from his Deck to his hand. He Normal Summoned it and Tahan discarded A-Assault Core from his hand to activate ABC-Dragon Buster’s effect and banish Denko Sekka. Next, Nadas banished Dragondark from his Graveyard to Special Summon Wyverburster and used Dragondark’s effect to add Thunder Dragonroar from his Deck to his hand. Tahan Tributed his ABC-Dragon Buster to activate its effect, Chained Widow Anchor to target Colossus, and then resolved the effects of his cards. He gained control of Colossus after negating its effect and Special Summoned A-Assault Core, C-Crush Wyvern, and B-Buster Drake to his field. Nadas banished 3 copies of Thunder Dragon to Summon Levianeer and activated its effect to Special Summon Dragonroar from his Graveyard in Defense Position. 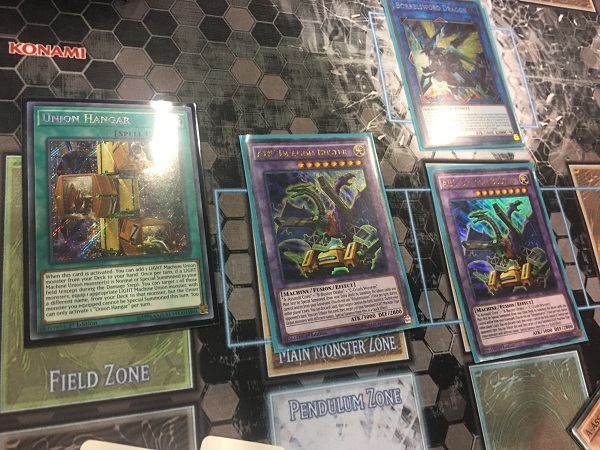 He sent his 3 monsters to the Graveyard to Link Summon Knightmare Unicorn and then used his Wyverburster and Dragonroar’s effects to Special Summon Dragonmatrix from his Deck and add Collapserpent to his hand. He banished Thunder Dragonhawk from his Graveyard to Special Summon Collapserpent and then used Dragonhawk’s effect to shuffle the card in his hand back into his Deck and draw a new card. 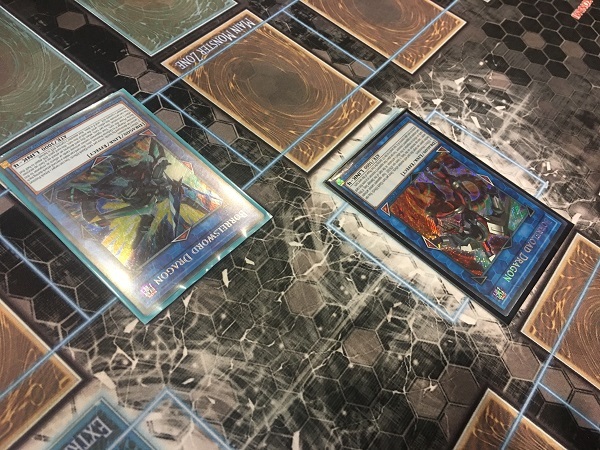 He sent Dragonmatrix to the Graveyard to Link Summon Linkuriboh and then used Dragonmatrix’s effect to add another Dragonmatrix to his hand. Next, he attacked C-Crush Wyvern with Unicorn to destroy it and attacked A-Assault Core with Collapserpent to destroy it. Tahan used A-Assault Core’s effect to add a copy of A-Assault Core from his Graveyard to his hand. Nadas ended his turn and gained back control of his Colossus. Tahan drew PSY-Framegear Gamma and then banished B-Buster Drake from his field along with A-Assault Core and C-Crush Wyvern from his Graveyard to Special Summon ABC-Dragon Buster linked to his Unicorn. He Normal Summoned A-Assault Core next and then attacked Linkuriboh with it. Nadas Tributed Linkuriboh for its effect. ABC-Dragon Buster attacked and destroyed Unicorn, and then Tahan’s Unicorn attacked and destroyed Collapserpent, dropping Nadas down to 4600 Life Points. Nadas added a Wyverburster from his Deck to his hand with Collapserpent’s effect. Tahan discarded Gamma to banish Colossus with Dragon Buster’s effect and then Link Summoned Knightmare Phoenix in Main Phase 2. Nadas Normal Summoned Batteryman Solar and activated its effect to send Thunder Dragondark from his Deck to his Graveyard. He banished the Thunder Dragondark to Special Summon Wyverburster and then used Dragondark’s effect to add Thunder Dragonroar to his hand. He discarded Dragonroar to add Thunder Dragon Fusion to his hand and then activated the Thunder Dragon Fusion! He returned a Dragonmatrix, Dragonroar, and Dragondark from his Banished Zone to his Deck to Special Summon Titan linked to Knightmare Phoenix and then used Batteryman Solar’s effect to Special Summon a Token. Tahan Chained ABC-Dragon Buster’s effect, Nadas Chained Dragonmatrix from his hand, and Tahan Tributed ABC-Dragon Buster to Special Summon the 3 pieces back to the field. In the Battle Phase, Nadas attacked C-Crush Wyvern with Colossus to destroy it and attacked A-Assault Core to destroy it with Wyverburster. Tahan drew Ash Blossom & Joyous Spring and then Normal Summoned A-Assault Core. He sent his 3 monsters to the Graveyard to Link Summon Borrelsword Dragon and then entered his Battle Phase. Nadas Tributed his Batteryman Token to Special Summon Linkuriboh and then Borrelsword attacked Wyverburster; but Nadas Tributed Linkuriboh to change Borrelsword’s ATK to 0. Nadas banished Thunder Dragon Fusion from his Graveyard and lost out on its effect to Ash Blossom & Joyous Spring. Next, he activated Allure of Darkness to draw 2 cards and banish Dragondark from his hand. He got Dragonhawk from his Deck with Dragondark’s effect and discarded it to Special Summon Dragonroar to the field. He then Tributed Dragonroar to Special Summon Thunder Dragon Colossus, used Dragonroar’s effect, and moments later, sent all of his monsters to the Graveyard to Link Summon Borreload Dragon! He attacked Borrelsword Dragon to take control of it with Borreload’s effect, and then Borrelsword attacked directly! Tahan drew Mind Control conceded on his next turn! Denis Nadas is moving on to the Finals!